Speak the name “Thomas Jefferson,” and it won’t be a minute before the subject of Monticello comes up. Jefferson’s magnificent mountaintop home in Charlottesville is an indelible reflection of the personality, character, and even the quirks of the third president of the United States. But what I didn’t know until recently is that Jefferson had a second home about sixty miles west of Monticello (about a three-day carriage trip in those days). Nestled along a winding mountain road south of present-day Lynchburg, Poplar Forest is where Jefferson spent the bulk of his retirement years, trying to evade his own celebrity and find time for peace, writing, and reflection. Not surprisingly, Poplar Forest somewhat resembles a miniature version of Monticello, but the first insight into Jefferson can be found before you even catch a glimpse of the house: Jefferson really, REALLY didn’t want to be bothered out here. 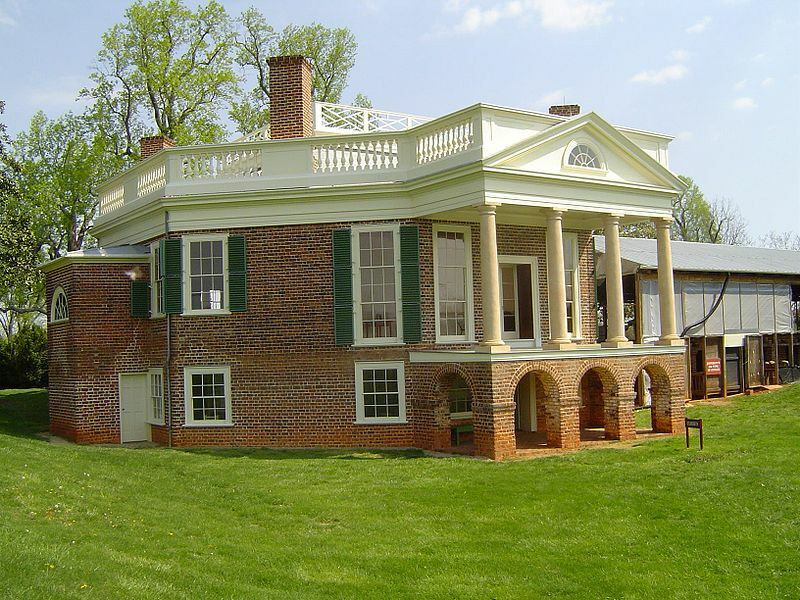 Even today, nestled in a quiet and semi-rural suburb, Poplar Forest can be reached only after trekking over a gravel road through a densely wooded area. 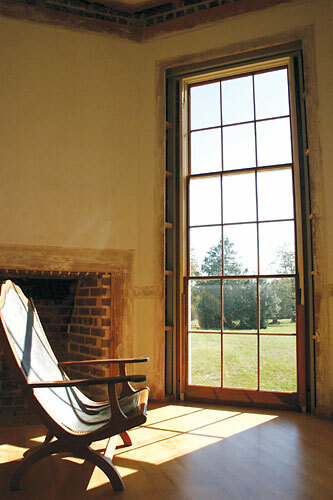 Campeachy chair at Poplar Forest. This back-saving style was Jefferson's favorite in old age; he bought several and had several others made by carpenter John Hemings (Sally Hemings' brother). The history of the mansion is very interesting. Jefferson inherited the property on which Poplar Forest stands from his wife. As he aged, he found the siege of visitors at Monticello unbearable, and built the house here as a retirement home and retreat. From the time he left the White House in 1809 until he was about 80 and became too old to make the trip, Jefferson spent much of the year at Poplar Forest, accompanied by his books and his brainy granddaughters. I really enjoyed learning about Jefferson’s granddaughters Ellen and Cornelia Randolph. 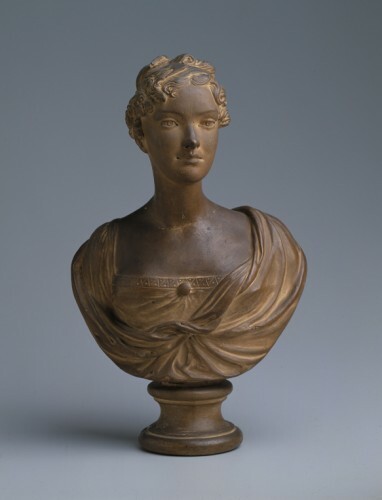 Ellen was 17 and Cornelia 20 when Jefferson first began living at Poplar Forest in 1816. Jefferson was proud of their studious ways, calling them “the severest readers I have ever met with,” quite a compliment from one of the great minds of any age. The girls were well-versed in history, philosophy, literature, and the classics, but they were also witty and fun-loving, as their letters reveal. And they brought out the doting side of Jefferson as no one else ever did. I laughed out loud in recognition of my own father at the story that Jefferson loaded up the carriage with a variety of sweaters and cloaks for the girls, in case they encountered any bad weather. As with Monticello, the house at Poplar Forest was quirky and sui generis — which created a problem after Jefferson passed away. Jefferson’s grandson Francis Eppes considered the estate a white elephant and sold it just two years after Jefferson’s death. For the families that came after, it was a completely impractical residence, and attempts to remodel and convert the large rooms to a more conventional lifestyle only damaged the historic character of the home without really making it more livable. In 1984, the house was purchased by a non-profit. A complete and amazingly detailed exterior renovation was completed in 2009, and an interior restoration is currently underway. As with Monticello, Jefferson monkeyed constantly with the house and the surrounding landscape, trying to apply various innovations and principles of design. For example, in one project, Jefferson had his slaves dig up the entire lawn to create a sloping effect. In a related project, they used the dirt to create an artificial hillside to “balance” an additional wing Jefferson had constructed on the other side of the house. The effort is lovely, I suppose, but for me it was difficult not to feel disgusted and aggravated with Jefferson’s self-indulgence and overspending, which left his family destitute after his death. We were fortunate to visit Poplar Forest on the greatest of all Jeffersonian holidays: July Fourth. The expansive lawn was buzzing with musicians in period costumes, historical demonstrations, and booths peddling fun old-fashioned crafts. We cooled off with a great snow cone while listening to the ceremonial reading of the Declaration of Independence. Poplar Forest is a fascinating Jefferson site, one that gives a fuller, more three-dimensional picture of the architect of westward expansion in his older years. It’s an architectural and cultural treasure, and I can’t wait to visit again in a few years to see the secrets of the interior restoration begin to reveal themselves. on December 16, 2010 at 9:14 am Debbie V.
I’m starting to become more interested in historical preservation as a result of my interest in genealogy/cemeteries. I enjoyed your article – especially the picture of the chair near the window. I ended up reading on and found this interesting booklet about the archaeology of Poplar Forest. Although my writing is historically based, the Founding Fathers are not my time period, and this post surprised me because I had no idea this place existed. Jefferson: the most mysterious of all the Founding Fathers. Just the thought of the slaves digging away…. Yeah. Jefferson. Piece of work, party of one, your table is ready.